English composer (b. Northampton, 21 October 1921; d. Norwich, 23 September 2006) active from the Second World War onwards (almost exact contemporary of Robert Simpson; therefore younger than William Walton, Benjamin Britten, Michael Tippett, Humphrey Searle and Edmund Rubbra; but older than Peter Maxwell Davies, Alexander Goehr, Harrison Birtwhistle, etc) – best known for his work for orchestra and/or brass ensemble. He was also a successful composer of music for film, and won an Oscar for "The Bridge on the River Kwai". Normal societies lock away their troublemakers, but the British have this peculiar habit of knighting theirs… and so, in 1993, a trumpeter, composer, conductor and firebrand called Malcolm Arnold woke up with the label "Sir" before his name (it's not known at this time whether he had to kneel before his Queen to collect the "gong"). It would appear, however, that Sir Malcolm has not permitted his belated respectability to tarnish a reputation for genial irrascability (from the interview appended to the National SO of Ireland/Andrew Penny recording of his Ninth Symphony: "There's life in the old dog yet")…. An impertinent beginning; but in many ways, Malcolm Arnold is an impertinent composer. To this day, the British musical establishment has struggled to get a handle on him… despite a flood of concerts in Britain celebrating Arnold's 75th year, the current (1996) London Proms program features one short work only (The Sound Barrier rhapsody as part of its "Last Night" carnival). Admittedly, even Arnold's admirers admit that sometimes he could be his own worst enemy… from the unexpected intrusion of the piccolos which shatter the dignity of his First Symphony through the persistently off-key foghorn of the Padstow Lifeboat march to the chilled despair of the Ninth Symphony, there are times when Arnold – like Dmitri Shostakovich – appears to have had a critical death wish… or at least, an agent provocteur's determination to antagonise as many people as possible. At a time when the critical mainstream in Great Britain was moving inexorably towards a clinical academicism, the sometimes savage accessibility of Arnold's music stood out like the proverbial sore thumb. Arnold's musical catalog is dominated by works for orchestra: nine symphonies; more than a dozen concerti (most written with specific performers in mind; including Dennis Brain, Larry Adler, Julian Bream, Benny Goodman, Julian Lloyd Webber and – in the case of the Philharmonic Concerto – the entire London Philharmonic Orchestra); six sets of symphonic dances and a number of popular programmatic overtures. Also popular and progammatic is his music for film… more than a hundred scores in all; including three films for David Lean ("The Sound Barrier", "Hobson's Choice" and "The Bridge on the River Kwai"), the 1956 version of "1984", "The Belles of St Trinian's", "Whistle Down The Wind", "The Angry Silence" and "The Inn of the Sixth Happiness". His instrumental and chamber music is less well known; but his Symphony for Brass Instruments (like the concerti, written with specific performers in mind – in this case, the trumpeter Philip Jones and his brass ensemble) is one of a number of masterworks written for brass ensemble. Unusually for a British composer, vocal works are inconspicuous in his output (the composer is on record as saying that texts are an intrusion on his abstract sound-world); but to be honest, Arnold's music has never been obviously British. … which he delivers in the form of the massive Lento finale (more than twenty-three minutes in the Naxos recording)… a finale built around a theme which at times seems not so much a melody in itself as the bassline under the melody. Again, the inspiration of the "Pathétique" seems clear; but like (to the my mind) the best performances of Tchaikovski's masterpiece, there's no sense of a self-indulgent wallow. This is a lonely, shattered vision, within which the musical persona of Arnold quietly picks himself up, brushes himself down and walks (with as much dignity as he can muster) into the abyss. The Ninth Symphony is music without hope, without redemption – just a slow progression of unresolved chords drifting inexorably through space (in places, the movement sounds like a self-pitiless symphonic suicide note). If anything, the symphony's final transcendent chord actually accentuates this sense of stoic despair – for all it's simple beauty, this is a climax which changes nothing… but at least it gives this musical lost soul a dignified exit. In the final scene of "Amadeus", Antonio Salieri – unfairly cast as the patron saint of mediocrity – walks proudly amongst the insane; and forgives them their unfortunate lack of genius. In a single chord of D Major, Arnold almost seems to be forgiving himself…. 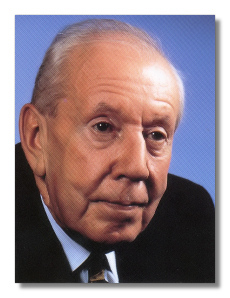 Despite changing musical tastes, the music of Malcolm Arnold has retained a solid popular following; which – in recent years – has translated into a significant discography… unsually for a living composer, most his key works are now available on disc; with more recordings on the way. Although now retired from composition, Arnold continues to involve himself with the recording of his music… which certainly keeps him active, since there are now three separate cycles of his complete symphonies under construction: the London Symphony Orchestra/Richard Hickox on Chandos; the National Symphony Orchestra of Ireland/Andrew Penny on Naxos and the Royal Philharmonic Orchestra/Vernon Handley on Conifer. A fascinating but sometimes chilling biography – "Philharmonic Concerto – the life and music of Sir Malcolm Arnold" by Piers Burton-Page – was published by Methuen in 1994… since the book deals candidly with the personal troubles which helped mould Arnold's astonishing Ninth Symphony, its essential reading for anyone interested in the composer and his music. "Arnold at 75" – a birthday tribute to Malcolm Arnold published as a supplement to the British Gramophone magazine – is also well worth having.